The Kubota 32pc Multi Tool Set is made to get the job done. This multi-tool set features comfort handles and superior metal construction. Offers a variety of screwdrivers, pliers and precision drivers. Different screwdrivers, pliers and precision drivers. The 63-Piece Household Tool Set from Husky contains all the tools needed for most repairs around the home. With comfort-grip handles and rugged, heat-treated tool construction, this comprehensive set is easy to use and built to last. Included are 6-inch high-leverage long nose pliers, 7-inch high-leverage diagonal pliers, 8-inch standard slip joint pliers, 8-inch groove joint pliers, 7-inch scissors, 6-inch double-speed adjustable wrench, 1 lb. fiberglass claw hammer, 4-piece precision screwdrivers, slotted screwdrivers ((1) 1/8, (2) 5/32, (2) 3/16, (2) 1/4, (1) 9/32), Phillips Screwdrivers (#00, #0, (3) #1, (2) #2, (3) #3,) 32-piece bits, (1) hex 1/8, (3) hex 5/32, (3) hex 3/16, (1) 1/4, (2) square 1, (2) square 2, (2) square 3, (1) T15, (1) T20, magnetic bit holder, utility knife, 10-piece knife blades with plastic dispenser, nut drivers (3/16-inch, 1/4-inch, 9/32-inch, 5/16-inch, 11/32-inch, 3/8-inch), screwdriver bit holder, and a blow-moulded case to keep everything organized. Kubota Folding Lock-Back Utility Knife comes with 10 utility blades that can lock in place for efficient cutting. Its handle is crafted with aluminum for strength and features a folding design to help ensure safety. 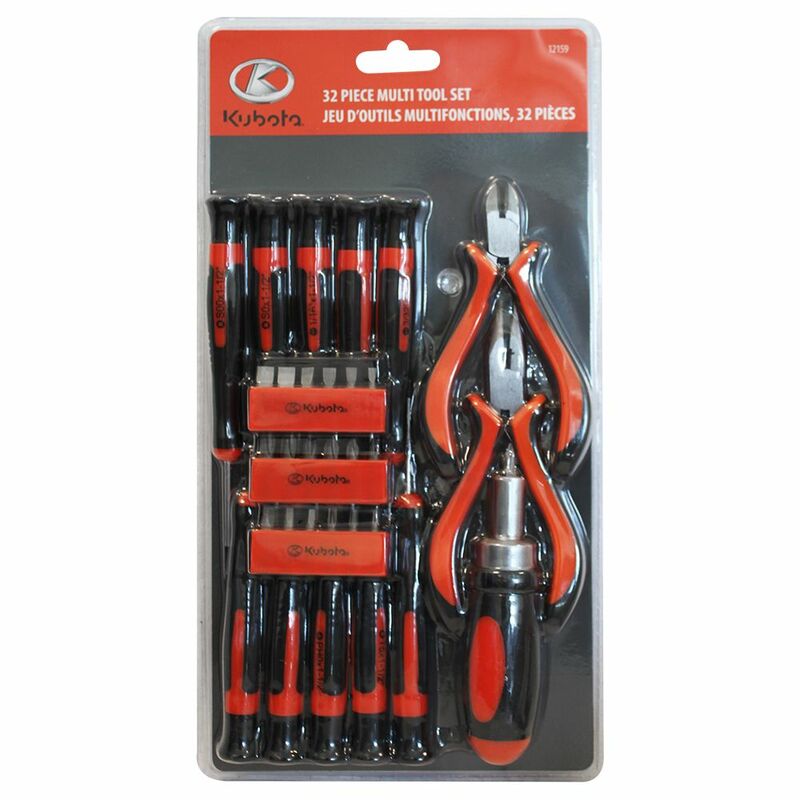 32 pc Multi Tool Set The Kubota 32pc Multi Tool Set is made to get the job done. This multi-tool set features comfort handles and superior metal construction. Offers a variety of screwdrivers, pliers and precision drivers.